31 October 2002 - I Think They Made Their Point. Repeatedly. On 31 October 2002, AS Adema won a match by the world record scoreline of 149-0. Adema, however, didn't score any of those goals. The match came in the final round of Madagascar's THB Champions League tournament, played among three teams in a round robin format. The reigning champions, Stade Olympique de L'Emyrne Antananarivo (SOE), had been eliminated in their previous match by a controversial last-minute penalty decision, making Adema the new champions with one match to spare--against SOE. With nothing at stake, SOE decided to use the match against Adema as a stage to protest their elimination. They kicked off and proceeded to put the ball directly into their own net. As Adema's players watched in astonishment, SOE continued to score an own goal from each successive kickoff, resulting in the final scoreline of 149-0, a margin recognized by the Guinness Book of World Records as the largest ever. Afterward, the Fédération Malagasy de Football suspended SOE's manager for three years. Four of SOE's players also received suspensions. On 30 October 2008, Nigerian midfielder Soo Adekwagh got her team off to a blazing start against South Korea in the 2008 U-17 Women's World Cup by scoring after only 22 seconds. Hosted by New Zealand, the 2008 tournament was the first FIFA-sponsored U-17 women's world championship. The tournament started two days earlier, but Nigeria and South Korea met on the first match day for Group D, which also included England and Brazil. Playing before a crowd of 11,500 at Wellington Stadium, Nigeria kicked off. Adekwagh (pictured, right) received the ball and fired a dipping shot toward goal. The ball surprised Korea's keeper, Lee Hyo Ju, who was unable to prevent it from going into the net. At 22 seconds, the goal bettered the previous record of 30 seconds, set by Sweden's Lena Videkull in 1991, as the fastest goal in FIFA women's history. Nigeria proceeded to win the match 2-1, but were eliminated in the group stage after a loss to England and a draw with Brazil. South Korea rallied to win the group, but were themselves ousted by the United States in the first knockout round. 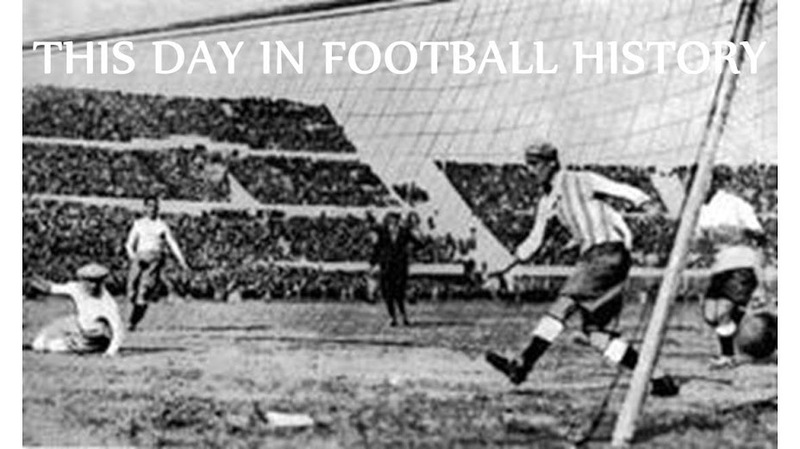 On 29 October 1933, Switzerland and Romania drew 2-2 in a World Cup qualifier. FIFA, however, later concluded that the Romanians had used an ineligible player and awarded the Swiss a 2-0 win instead. The controversial match was the second in the three-team qualification group that also included Yugoslavia. The Swiss had already drawn with Yugoslavia, while Romania had not yet played. The teams met at the Wankdorf Stadion in Bern, where the visitors went up 0-2 with goals from forwards Gratian Sepi (18') and Stefan Dobay (65'). Switzerland pulled back within one after a score from forward Erwin Hochstrasser (75'), then midfielder Ernst Hufschmid converted an 80th-minute penalty to earn what they thought was a draw. 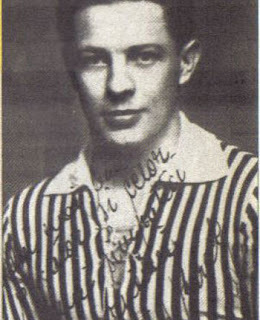 After the match, Swiss officials complained to FIFA that Romania had illegally included forward Iuliu Baratky (pictured). Baratky had made nine appearances for Hungary between 1930 and 1933, making him ineligible to play for neighboring Romania. In response, FIFA recorded the match as a 2-0 Swiss victory. Romania went on to defeat Yugoslavia 2-1 to qualify for the tournament anyway. Meanwhile, Baratky continued to play for them, making a total of 20 appearances and scoring 14 goals from 1933 to 1940. On 28 October 1993, a late Iraqi goal denied Japan their first World Cup appearance in a match Japanese supporters call "the Agony of Doha." The two teams met on the final day of Asian Football Confederation qualification for the 1994 World Cup. With four of their five matches already played, Japan were at the top of the group with 5 points, while Iraq were three places back on 4 points. 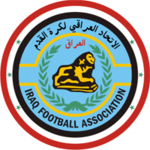 A win for Japan would have sent them through to their first-ever World Cup, while the Iraqis needed both a win and favorable results in the day's other two matches. Playing before a crowd of 15,000 at the Al-Ahly Stadium in Doha, Qatar, Japan took a quick lead thanks to forward Kazuyoshi Miura's 5th-minute strike. The two sides then exchanged second-half goals, with forward Ahmad Radhi equalizing for Iraq in the 54th minute, followed by an 80th-minute goal from Japanese forward Masashi Nakayama to restore the Blue Samurai's advantage. But in the 90th minute, as the Japanese supporters began making their World Cup plans, substitute Jaffar Salman headed a cross past Japanese keeper Shigetatsu Matsunaga. The match ended 2-2, eliminating both Iraq and Japan from the tournament. Saudi Arabia won the group, while Japanese arch-rivals South Korea took the second and final qualification spot. On 27 October 1944, construction began at Real Madrid's new stadium, the Nuevo Estadio Chamartín. 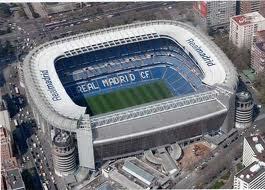 Now known as the Estadio Santiago Bernabéu, it is one of the world's most famous football venues. The club had played previously at the old Estadio Chamartín, which was constructed in 1923 and held a crowd of 22,500. By 1944, however, club decided it needed a larger stadium to accommodate the growing supporter base. In June of that year, they purchased land next to their existing stadium and began planning the construction of the new one. The construction lasted just over three years, resulting in a new capacity of 75,145 (27,645 were seated, with the remainder on terraces). On 14 December 1947, Real Madrid inaugurated their new home with a match against Portuguese side Os Belenenses. The stadium has undergone several renovations over the years, at one point expanding to hold a partially seated crowd of 125,000. It has since been converted to an all-seater with a current capacity of 80,354. During that time, it has hosted important matches including four World Cup matches and the 2010 Champions League Final. In 1955, the club chose to rename it after the man who spearheaded its construction, former club president Santiago Bernabéu. On 26 October 1938, Europe put together their first continental XI to challenge England. And lost 3-0. England had split from FIFA ten years earlier over a dispute about payments for amateur players, but continued to play other nations in a series of friendlies, including a win over World Cup champions Italy in 1934 and a 6-3 pounding of Germany in Berlin during a May 1938 European tour. It is not clear what prompted the formation of that first European XI, but the match coincided with the 75th anniversary of the founding of England's Football Association. 45,000 people turned out to watch the teams at London's Highbury Stadium. 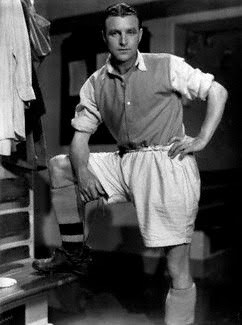 England were led by captain Eddie Hapgood (pictured) and his Arsenal teammate Wilf Copping, but the side also included up-and-coming stars like Stoke's Stanley Matthews, who had scored a hat-trick against Czechoslovakia the previous year. Europe, meanwhile were led by Italian national Silvio Piola, who had scored twice in the Azzurri's 4-2 win over Hungary in the 1938 World Cup Final. The side included three other Italians, as well as players from Belgium, France, Norway, and Hungary. England went up 2-0 by halftime, with goals from George Hall (20') and Thomas Lawton (39'), before Len Goulden finished the day's scoring in the 73rd minute to end the match at 3-0. 25 October 2007 - They Didn't Give Him Much Incentive To Win It, Did They? On 25 October 2007, manager Martin Jol guided Tottenham Hotspur in their UEFA Cup tilt against Getafe despite being sacked earlier that day. 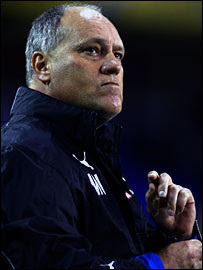 Jol, who had taken charge of Spurs in November 2004, led them to 9th-place in the final table that season, followed by consecutive 5th-place finishes in 2006 and 2007. But they had a rocky start to the 2007-08 season, with only one win in their first 10 matches. After only two matches, photographers caught Spurs officials meeting in a Spanish hotel with Sevilla manager Juande Ramos, fueling rampant speculation that Jol's departure was imminent. Prior to the match against Getafe, Daily Mirror reporter John Cross announced that the Spurs board had in fact sacked Jol, but that he would nonetheless take charge of the side one last time. The word circulated throughout the stadium, leading the Spurs supporters to chant "Stand up for Martin Jol." But it was an unhappy curtain call for the Dutchman, as Getafe won 1-2. Ramos indeed succeeded Jol, but lasted just under one year before getting sacked himself. Jol, meanwhile, moved to Hamburg. After guiding them to a 5th-place finish in 2008, he moved to Ajax. Labels: Getafe C.F., Juande Ramos, Martin Jol, Tottenham Hotspur F.C. 24 October 1953 - Not Who You Thought They Would Be, Were They? On 24 October 1953, East Fife defeated Partick Thistle 3-2 in the Scottish League Cup Final, becoming the first-ever team to lift the Cup three times. 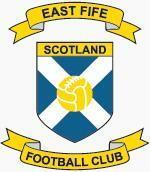 Founded in 1903, East Fife won their first major trophy in 1938 by beating Kilmarnock in the Scottish Cup Final. In the process, the Fifers became the only Second Division team to win that Cup. They went on to win their first Scottish League Cup in 1947, then again in 1949. In 1953, East Fife--by then in the top flight--advanced through the League Cup with wins over Aberdeen, Airdrieonians, and Celtic in the preliminary round, then beating Dunfermline Athletic 9-4 on aggregate in the quarterfinal. They edged Hibernian 3-2 in the semifinal to set up the meeting with Partick Thistle. Playing before a crowd of 38,529 at Glasgow's Hampden Park, Partick Thistle got goals from right winger Johnny McKenzie and left winger Jimmy Walker, but the Fifers won with scores from right half Frank Christie and inside forwards Charlie Fleming and Ian Gardiner. Unfortunately, their third Cup win was their last. East Fife were relegated in 1958 after 10 seasons in the top flight and currently play in the League Two, which is the fourth tier in the Scottish football pyramid. Labels: 1953 Scottish League Cup Final, Charlie Fleming, East Fife FC, Frank Christie, Ian Gardiner, Jimmy Walker, Johnny McKenzie, Partick Thistle F.C. On 23 October 1921, England and Ireland opened the British Home Championship, with England winning 2-0. It was their only win of their tournament. The 1921 tournament was only the second time it had been played since the end of World War I. England, who had recently surpassed Scotland as the most successful side in the competition, had fared poorly in the 1920 edition, finishing third behind Wales and Scotland, and were looking to reclaim the trophy. They started off well, topping Ireland with goals from Burnley inside forward Bob Kelly and Aston Villa striker Billy Walker. But England's scoring touch deserted them and, after a subsequent scoreless draw with Wales and a 3-0 loss to Scotland, they again finished third. Ireland finished fourth with three losses in three matches. England's two scorers went on to make history of their own, however. Kelly left Burnley for Sunderland in 1925 for the then-British record transfer fee of £6,550. Walker remained with Villa for his entire career and found the net a total of 244 times in all competitions to make him their record goalscorer. 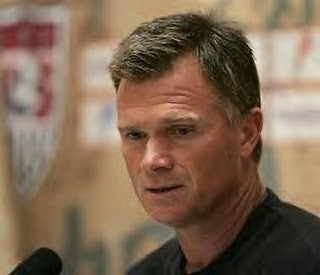 On 22 October 2007, the United States Soccer Federation announced their decision to part ways with women's national team manager Greg Ryan (pictured) despite a record of 45 wins, 9 draws, and 1 loss. That loss, however, was a big one, coming against Brazil in the quarterfinals of the 2007 Women's World Cup. Prior to the match, Ryan benched starting goalkeeper Hope Solo--who had conceded only 2 goals in the tournament--in favor of veteran Brianna Scurry. Scurry had done well against Brazil in the past, but had not played a full match in over three months. The decision did not go well, as Brazil delivered a 4-0 pounding--the worst-ever loss for the US women and the end to a 51-match unbeaten streak. Solo spoke out against Ryan and Scurry after the match, leading to her being dropped from the squad for their third-place match against Norway. The situation prompted the USSF's announcement in October that they would not renew Ryan's contract when it expired the following December. They eventually hired Pia Sundhage that November, while Ryan went on to coach at the University of Michigan. 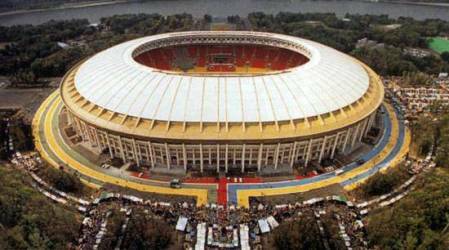 On 20 October 1982, Russia suffered its worst sporting disaster when at least 66 people died as a result of a stampede at Spartak Moscow's Luzhniki Stadium. Some reports place the number of casualties as high as 340. A crowd of approximately 10,000 was there that day to watch Spartak Moscow challenge HFC Haarlem in the second round of the UEFA Cup. The low number of spectators, caused in part by extraordinarily cold weather that day, prompted stadium officials to open only the East Stand, with only one exit. Spartak took a 1-0 lead into injury time and several supporters made their way out of the stadium. But a late goal from Spartak defender Sergei Shvetsov drew several of them back toward the stands to join in the celebration. The two streams of people met at the exit, where dozens of people were trampled and crushed. The official death toll is 66, but eyewitnesses claim to have seen hundred of bodies. Russian authorities initially covered up the incident, with newspapers reporting only that there had been an accident at the stadium that had injured some supporters. Russian newspaper Sovetsky Sport finally broke the full story in 1989--seven years later. Three years after that, a memorial was placed outside the stadium. On 19 October 2007, Drogheda United defeated Cork City 2-1, clinching their first League of Ireland title with three matches to spare. 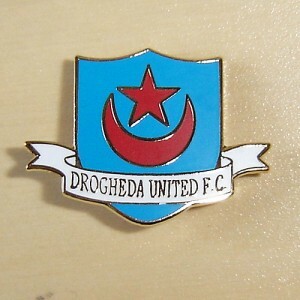 Drogheda United was founded in 1975 as a merger between two previously established clubs--a former Drogheda United that dated back to 1919 and Drogheda FC, founded in 1962. Despite some early successes, including winning the 1984 League of Ireland Cup, they spent most of the intervening years moving back and forth between the top two divisions before securing their Premier Division foothold in the early 2000s. At the end of 2005, they had added an FAI Cup their trophy room, followed shortly by the 2006 Setanta Cup. But the league title eluded them until the 2007 season. That year, Drogheda rose to the top of the table in June and held fast for the remainder of the season. They had drawn against Cork City in both of the previous meetings that year and appeared to be headed for another draw with the teams level at 1-1 near the death. But Drogheda striker Guy Bates netted a goal in the final minute to clinch the title ahead of second-place finisher St. Patrick's Athletic. Although they also won a second Setanta Cup that season, the success was short-lived. They finished 2008 in 8th place, then dropped to 9th place in 2009, avoiding relegation only through a 2-0 win over Bray Wanderers in the relegation playoff. On 18 October 1873, Renton FC won the first-ever Scottish Cup match, defeating Kilmarnock 2-0. Because the Scottish Cup predates league play, that match was the first competitive match in Scotland. Sixteen clubs entered the inaugural tournament, which started with an unseeded knockout round. The clubs contributed the money used to purchase the cup and medals--a total of £56 12s 11d. Of those first eight matches, two were forfeits. The widest winning margin was Queen's Park's 7-0 victory over Dumbreck, followed closely by Clydesdale's 6-0 win over Granville. Renton advanced to the semi-finals, where they lost to eventual winners Queen's Park, 2-0. A year later, the same two teams met in the Final, with Queen's Park winning again. 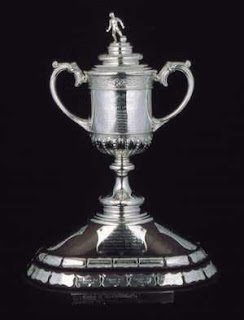 Although the FA Cup tournament predates the Scottish Cup by two years, the first FA Cup trophy was stolen in 1895, making the current Scottish Cup the oldest existing national tournament trophy in the world. On 17 October 2009, Sunderland defeated Liverpool 1-0 with a little help from a beach ball. Playing before a crowd of 47,327 at Sunderland's Stadium of Light, striker Darren Bent's 5th-minute shot hit a beach ball that had been thrown onto the pitch (presumably by a Reds supporter, as the ball bore the Liverpool crest). As goalkeeper Pepe Reina followed the beach ball to his right, the football flew past him on the left and into the net. Although the laws of the game suggested that referee Mike Jones should have disallowed the goal in favor of a dropped ball at the site of the deflection, he let the score stand. Liverpool struggled to mount a comeback, playing without injured skipper Steven Gerrard and forward Fernando Torres. Their attack was reduced to a handful of long-range chances, while Bent came the closest to adding to the scoreline on a couple of opportunties. With seven minutes of added time in the second half, Sunderland keeper Craig Gordon twice denied shots for Dirk Kuyt and David Ngog to preserve the win. Labels: Darren Bent, Liverpool F.C., Pepe Reina, Sunderland A.F.C. On 16 October 1878, a group of amateur footballers in Ipswich founded a new club they named Ipswich AFC. 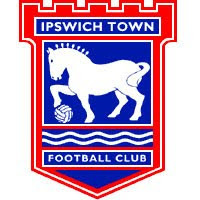 Now known as Ipswich Town FC, the club would go on to earn domestic and European titles, as well as provide two of the most successful managers to the English national team. Ipswich remained an amateur side until 1936, when they turned professional and joined the Southern League. They joined the Football League two seasons later, starting in the Third Division. In 1955, they hired former Tottenham star Alf Ramsey as manager. It proved to be a brilliant hire, as Ramsey proceeded to lead them to the Second Division in 1957, then to the First Division in 1961. Ipswich won the League in 1962, at the end of their first season in the top flight. Ramsey left in 1963 to manage England. Ipswich dropped back into the Second Division for the 1964-65 season. But Ipswich enjoyed another period of success after hiring Bobby Robson in 1969. Under Robson, Ipswich won the FA Cup in 1978 and the UEFA Cup in 1981. In 1982, Robson followed the path of Ramsey and left to manage the national team. They have spent the intervening years moving back and forth between the top two divisions. They currently play in the Championship under manager Mick McCarthy. On 15 October 1949, England and Wales met in the first World Cup qualifier for both teams, with England winning 1-4. The English and Welsh football associations had joined FIFA in 1906, but left in 1929, along with the other British associations, over a dispute about payment of amateur players. The rift prevented all of British teams from participating in the first three World Cups. The British rejoined FIFA in 1946. 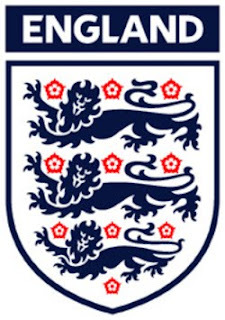 Rather than have them go through a separate qualification process, FIFA used the pre-existing British Home Championship as a qualification group, with the top two finishers advancing to the World Cup. The teams met at Ninian Park in Cardiff, with England taking an early lead with a 22nd-minute goal from Blackpool's star forward, Stan Mortensen--the first England goal in a World Cup campaign. 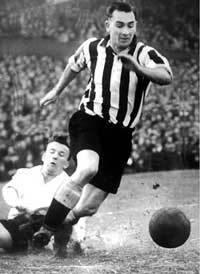 His fellow forward, Newcastle's Jackie Milburn (pictured) then added a hat-trick (29', 34', 66') before Wales eventually got on the board with a late consolation goal from right winger Mal Griffiths. England and Scotland finished first and second in the table to progress to the World Cup, but Scotland withdrew because the head of the Scottish FA, George Graham, felt they should participate only if they won the BHC. England participated and were famously defeated by the United States. On 14 October 1873, former FIFA President and World Cup founder Jules Rimet was born in the French village of Theuley-les-Lavoncourt. A lawyer by training, Rimet first got involved with football in 1897 when, at the age of 24, he founded a sports club on the outskirts of Paris and called it Red Star. Despite not being a footballer himself, he chose football as one of the sports to be played at the club. 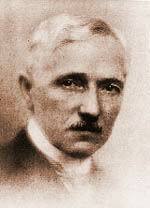 After serving in World War I and winning the Croix de Guerre, Rimet became the first president of France's new football association, the Fédération Française de Football (FFF), in 1919. Two years later, he became the president of FIFA. At the time, FIFA had only a dozen members. By the time he retired in 1954, that number had grown to 85. It was during his time at FIFA that he pushed his idea for an international tournament that became the World Cup. In recognition, FIFA named the first trophy after him. He died in 1956, two days after his 83rd birthday. Labels: FIFA, Jules Rimet, Red Star F.C. On 13 October 2006, FIFA announced its decision to dock Cameroon 6 points in their qualification campaigns for the 2010 World Cup and 2008 African Cup of Nations--all because the Indomitable Lions wore a unitard. 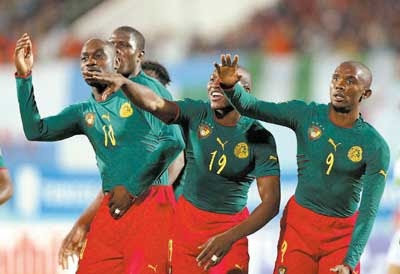 Cameroon had a history of kit controversy after wearing sleeveless shirts at the 2002 African Cup of Nations. Afterward, FIFA told them they could not wear them at the 2002 World Cup, so Puma, Cameroon's kit maker, added black sleeves for that tournament. For the '04 Cup of Nations, Puma provided Cameroon with a new kit. Although the shirt and shorts appeared to be separate, they were actually connected to form a one-piece. Cameroon wore the kit for the tournament's first round, but FIFA told them afterward that they could not wear it for the later rounds. Cameroon, however, pleaded that it was too difficult to obtain replacement kits on such short notice and wore the one-piece for their quarterfinal match against Nigeria on 8 February (Nigeria won, 2-1). After FIFA announced its long-awaited punishment, it eventually relented and rescinded the points penalties. Meanwhile, Puma took FIFA to court, arguing that the rules of the game did not require the shirt and shorts to be separate. They lost, too. On 12 October 1916, two groups of college students in Mexico City joined forces to create Club América. It has since become one of Mexico's most successful clubs. Students from Colegio Mascarones and Colegio Marista De La Perpetua had earlier formed two separate football clubs by the names of Récord and Colón. But on 12 October--Columbus Day--they decided to merge. Pedro Quintanilla, one of the players, suggested the name Club América in honor of the founding date and the team soon adopted a badge that had the initials framing an outline of the Americas. América enjoyed a successful period through the 1920s, winning four consecutive regional league titles from 1925 to 1928. 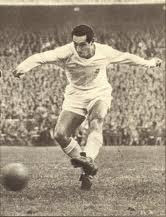 Their fortunes turned soon after, however, and they didn't win any national silverware until the 1953-54 Copa México. The late '50s heralded a return to their winning ways and the club now boasts a total of 12 Mexican top flight titles (most recently the 2014 Apertura) and 5 Copas México. They have also enjoyed international success, winning 5 CONCACAF Champions' Cups (1978, 1987, 1991, 1993, 2006). On 11 October 2006, Croatia defeated England 2-0 in a Euro 2008 qualifier due in part to a freakish English own goal. Played before a crowd of 38,000 at Maksimir Stadium in Zagreb, it was the third match of the campaign for both sides, with neither yet conceding a goal. 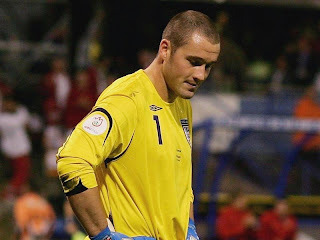 Spurs goalkeeper Paul Robinson was in goal for England, following his strong performance at the 2006 World Cup in which he kept clean sheets in 4 of the 5 matches England played. The two sides battled to a scoreless stalemate in the first half, with Robinson making a trio of key stops to deny Eduardo, Niko Kranjčar, and Mladen Petric. But Eduardo finally beat Robinson with a 61st-minute header to put Croatia up 1-0. Disaster for England followed shortly afterward. In the 69th minute, midfielder Gary Neville sent a pass back to Robinson. As the ball rolled tamely toward him, the keeper stepped up to launch it up the pitch. But just as he swung his leg, the ball hit a divot and bounced over Robinson's foot. As Robinson tried to turn, the ball continued rolling, right into the goal. Croatia went on to win the match 2-0, on their way toward topping the qualifying group. England finished third, one point behind second-place Russia and one spot too low to qualify. Robinson went into international exile, going for over two years until his next England call-up, and retired from the national team in 2010. On 10 October 2009, Huddersfield Town defeated Exeter City 4-0 with a record performance from striker Jordan Rhodes (pictured). Rhodes scored a header-only hat-trick in a span of 8 minutes, 23 seconds - the fastest time anyone has accomplished that feat in an English match. Playing before a home crowd of 13,438 at Galpharm Stadium, the Terriers went up 1-0 when forward Lee Novak scored in the 17th minute. The visitors squandered a couple of opportunities for an equalizer when Rhodes doubled the lead with a near-post header in the 44th minute. After the break, he picked up where he had left off, scoring another header in the 49th minute, then another in the 52nd--three goals in a span of just over 8 minutes. He was denied another goal only by Huddersfield manager Lee Clark, who replaced him in the 64th minute with forward Theo Robinson. On 9 October 1875, a crowd of 12,000 people gathered at Glasgow's Hampden Park to see Queen's Park FC defeat English side Wanderers FC 5-0. Apart from the impressive scoreline, the match is notable for being the first known one at which programs were sold to the attendees. The program for that match consisted of a single sheet listing the date, location, and line-ups for both sides (including C.W. Alcock, the founder of the FA Cup, at center half for Wanderers). It also included an admonition to the crowd: "Please do not strain the ropes." Since then, programs have expanded to multi-page, professionally printed booklets. They have also become an industry unto themselves, with a vigorous collection market. Early versions fetching premium prices at auctions, as do programs from eventful matches, such as World Cup Finals. The highest recorded price for a program is £21,850, paid at a May 2006 auction for a single-sheet copy of the program from the 1889 FA Cup Final between Wolverhampton Wanderers and Preston North End. 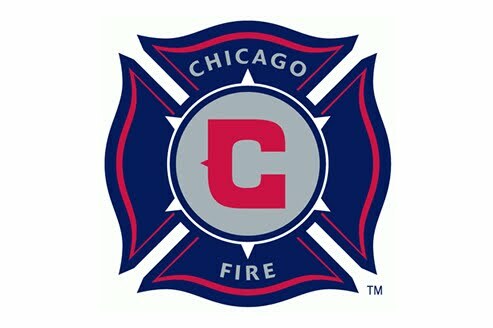 On 8 October 1997, Major League Soccer welcomed its newest club, the Chicago Fire. The announcement was made on the 126th anniversary of the Great Chicago Fire of 1871, one of the worst US disasters of the 19th century. MLS had begun play in 1996 with 10 teams and decided in 1997 to add two more for the 1998 season, awarding franchises to Chicago and Miami. The announcement on 8 October revealed the new name of the Chicago team, chosen to reflect the importance of the 1871 fire in the city's history. Chicago were instantly successful. Guided by head coach Bob Bradley, captain Piotr Nowak, and MLS Defender of the Year Luboš Kubík, they won both the MLS Cup and the US Open Cup in their first season. They have maintained that success over the years, returning to the MLS Cup Final in 2000 and 2003--finishing as runners-up both times--and winning the US Open Cup three more times (in 2000, 2003, and 2006). In 2009, they advanced to the Final of the North American SuperLiga tournament, losing on penalties to UANL Tigres. 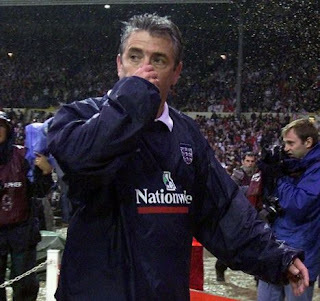 On 7 October 2000, Kevin Keegan resigned as England manager--from the bathroom. Keegan, who had made 63 appearances for England from 1972 to 1982, took over from Glenn Hoddle as manager of the Three Lions in February 1999, after spells in charge of Newcastle (1992-97) and Fulham (1998-99). His first match in charge was a 3-1 win over Poland in a Euro 2000 qualifier. But after qualifying for the tournament, England were eliminated in the group stage. The following autumn, England opened their qualification campaign for the 2002 World Cup with a 1-0 loss to Germany at Wembley on 7 October. Apart from being disappointed in the result, Keegan was livid that the British press had reported his team selection prior to the match, giving the Germans what he perceived to be an unfair advantage. In the locker room after the match, Keegan decided to resign. Acting FA chief David Davies pulled Keegan into the only private space available - a toilet stall - and tried to change his mind. When Keegan refused, Davies summoned two members of the FA to the stall so they could receive his resignation before hearing about it from the press. 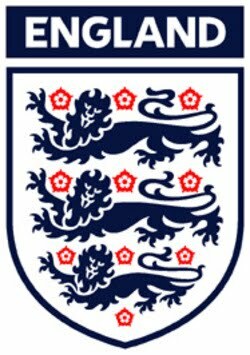 Keegan returned to management with Manchester City (2001-05) and Newcastle (2008), but his 38.9% winning percentage with England makes him the national team's least successful manager, statistically. On 6 October 1877, Rangers secured their record margin of victory, beating Possil Park 13-0 in the first round of the Scottish Cup. They matched that scoreline just over a month later in the same tournament, but failed to lift the Cup after going out in the fourth round. 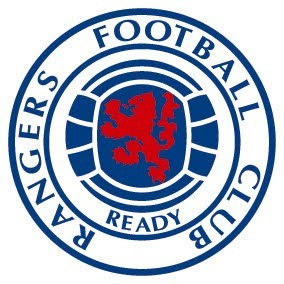 At the time, Rangers were still a young club, formed only five years earlier. They got off to a strong start, however, winning their second-ever match by the score of 11-0. (A year later, they had their first annual meeting and elected staff, so that the club itself recognizes their official founding year as 1873.) By 1876, they were an established side, advancing to the 1876-77 Scottish Cup Final, where they took Vale of Leven to a second replay before falling 3-2. They approached the 1877-78 Scottish Cup with the intention of returning to the Final and were encouraged by their 13-0 win over Possil Park FC in the first round. In the second round, they defeated Alexandra Athletic by the relatively low score of 8-0, then crushed Uddingston FC 13-0 in the third round. Unfortunately for Rangers, they met Vale of Leven in the fourth round and fell 5-0 in a replay. They had to wait until 1897 before finally lifting the first of their 33 Scottish Cups. 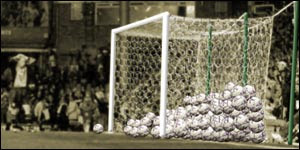 On 5 October 1929, somebody scored the English Football League's 100,000th goal. But nobody is quite sure who it was. The milestone goal was the 65th one scored that day, just over 41 years after Bolton's Kenny Davenport scored the League's first goal on 8 September 1888. Unfortunately, it is impossible to identify the responsible individual because no records exist to indicate the timing of the scores. In all, 44 matches were played that day in the four League divisions, delivering a grand total of 150 goals. Division Three (South) delivered the most with 50, including the day's highest tally - a 6-3 victory by Swindon Town over visiting Merthyr Town. In Division One that day, the high-water mark was 6, set by Sheffield Wednesday's 2-4 win at Burnley. Division Two matched that number with Blackpool's 2-4 win at Barnsley and Notts County's 3-3 home draw with Stoke City. Division Three (North) followed with 5, set by Darlington's 3-2 home win over Halifax Town and Crewe Alexandra's away win over Stockport County. Of the 44 matches played that day, only three finished as scoreless draws. Labels: Football League, Merthyr Town FC, Swindon Town F.C. 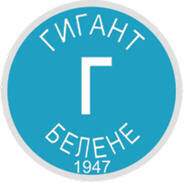 On 4 October 2009, a Bulgarian third division match ended after only four minutes due to injuries. The match between hosts Gigant Belene and visitors Chavdar Byala Slatina was promising, with Gigant sitting second in the table at the start of the day. But a combination of injuries and suspensions left them with only eight players available for kick-off. Within four minutes, two additional Gigant players suffered injuries and had to leave the match. Under the rules, each side must have at least seven players on the pitch, so when Gigant dropped to six, the referee had no choice but to stop the match and award the points to Chavdar as a forfeit. The match was recorded as a 3-0 win for the visitors. At the time, it was the shortest match ever played in Bulgaria. But the record lasted less than six months - in March 2010, Gigant traveled to Belogradchik with only seven available players, one of whom picked up a match-ending injury in the first minute. Gigant eventually finished the season in 11th place, while Chavdar topped the table and won promotion to the second division. 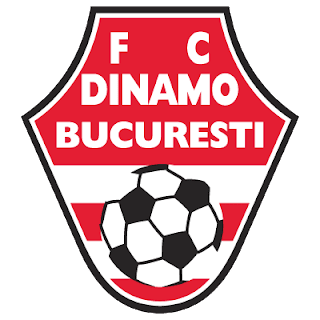 On 3 October 1973, Romania's Dinamo Bucureşti set a European Cup/Champions League record by beating Northern Ireland's Crusaders FC by the score of 11-0. To make matters worse for Crusaders, the record-setting eleventh goal was an own goal. The two teams met in the first round of the competition, with Dinamo scraping out a narrow 0-1 victory in the first leg, played in Belfast. The lone goal in that match was scored in the first minute by midfielder Viorel Sălceanu.Sălceanu failed to get on the score sheet in the second leg, played in Bucharest. The slack was picked up by striker Dudu Georgescu (7', 14', 47', 63') and midfielder Radu Nunweiller (19', 40', 75', 81'), with help from center back Cornel Dinu (52') and striker Florea Dumitrache (67'). Collectively, they gave Dinamo a comfortable 10-0 lead into the match's dying moments. Then, in the 88th minute, Crusaders defender Liam Beckett knocked the ball into his own goal to extend Dinamo's lead to 11-0. Although Dinamo hoped the resounding win would be a catapult to further success in the tournament, it was not to be, as they were eliminated in the second round by Atlético Madrid. 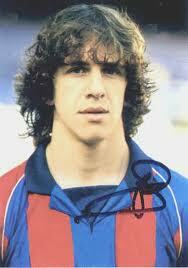 On 2 October 1999, 21-year old Barcelona defender Carles Puyol made his first-team debut in a 2-0 win at Real Valladolid. Since then, Puyol has made almost 500 appearances for the senior side and has captained them to several honors, including six La Liga titles and three UEFA Champions League trophies. Easily recognized by his long curly hair, Puyol started his career in 1993 with the Pobla de Segur junior squad, but moved to Barça's youth academy in 1995, then to their B squad in 1997. He originally joined the Catalan squad as a defensive midfielder, but switched to right back, then to center back. He was named captain at the end of the 2003-04 season. The move coincided with Barça's return to glory, as the following season, he led the team to their first La Liga title in six years. By his retirement in May 2014, Puyol won a total of six La Liga titles, three Champions League trophies, six Spanish Cups, six Spanish Supercups, two UEFA Supercups, and two FIFA Club World Cups. With Spain, he won the 2008 European Championship and the 2010 World Cup. On 1 October 1977, Pelé played the last match of his outstanding career - an exhibition between his two former clubs, the New York Cosmos and Santos, with Pelé playing one half for each side. The match was played at New Jersey's Giants Stadium before a capacity crowd of 77,000 that included such luminaries as President Jimmy Carter and Muhammad Ali. 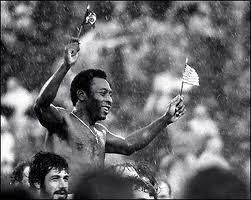 After a pre-match speech in which he asked the crowd to chant "love" three times, Pelé played the first half for the Cosmos and the second for Santos. Santos took the lead with a first-half goal from Reynaldo, but Pelé equalized for the Cosmos off a direct free kick. It was the final goal of his career. At the half, the Cosmos retired his jersey as he exchanged it for a Santos shirt. His replacement for the Cosmos, striker Ramon Mifflin, then scored the match winner in the second half. When the match ended, several Cosmos players lifted Pelé and carried him around the stadium as he held a US flag in one hand and a Brazilian flag in the other. Labels: New York Cosmos, Pelé, Ramon Mifflin, Reynaldo, Santos F.C.